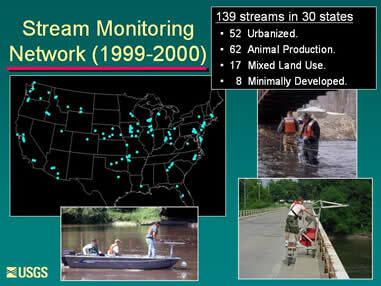 Water samples were collected from a network of 139 streams across 30 states during 1999 and 2000. The sampling sites focused towards streams considered to be susceptible to contamination and were derived from a wide variety of hydrogeologic, climatic, and land-use settings across the United States. The results show that a broad range of chemicals found in residential, industrial, and agricultural wastewaters commonly occurs in mixtures at low concentrations in streams in the United States. The chemicals detected include human and veterinary drugs, natural and synthetic hormones, detergent metabolites, plasticizers, insecticides, and fire retardants. One or more of these chemicals were found in 80% of the streams sampled. Half of the streams contained 7 or more of these chemicals, and about one-third contained 10 or more of these chemicals. This study was the first national-scale examination of emerging contaminants in streams of the United States. Barnes, K.K., Kolpin, D.W., Meyer, M.T., Thurman, E.M., Furlong, E.T., Zaugg, S.D., and Barber, L.B., 2002, Water-quality data for pharmaceuticals, hormones, and other organic wastewater contaminants in U.S. streams, 1999-2000: U.S. Geological Survey Open-File Report 02-94. Buxton, H.T., and Kolpin, D.W., 2002, Pharmaceuticals, hormones, and other organic wastewater contaminants in U.S. streams: U.S. Geological Survey Fact Sheet FS-027-02, 2 p.
Erickson, B.E., 2002, Analyzing the ignored environmental contaminants: Environmental Science and Technology, v. 36, no. 7, p. 140 A-145 A.
Focazio, M.J., Kolpin, D.W., and Buxton, H., 2003, Pharmaceuticals, hormones, personal-care products, and other organic wastewater contaminants in water resources -- recent research activities of the U.S. Geological Survey's Toxic Substances Hydrology Program: GeoHealth News, v. 2, no. 1, September 2003, p. 3-7. Focazio, M.J., Kolpin, D.W., Furlong, E.T., 2004, Occurrence of human pharmaceuticals in water resources in the United States--A review:., in Kummerer, K., ed., Pharmaceuticals in the environment--Sources, fate, effects, and risks, 2nd Edition, Springer-Verlag, pp. 91-102. Kolpin, D.W., Furlong, E.T., Meyer, M.T., Thurman, E.M., Zaugg, S.D., Barber, L.B., and Buxton, H.T., 2002, Pharmaceuticals, hormones, and other organic wastewater contaminants in U.S. streams, 1999-2000--A national reconnaissance: Environmental Science and Technology, v. 36, no. 6, p. 1202-1211. Kolpin, D.W., Furlong, E.T., Meyer, M.T., Thurman, E.M., Zaugg, S.D., Barber, L.B., and Buxton, H.T., 2002, Response to comment on "Pharmaceuticals, hormones, and other organic wastewater contaminants in U.S. streams, 1999-2000: A national reconnaissance": Environmental Science and Technology, v. 37, no. 5, p. 1054. Kolpin, D.W., Furlong, E.T., Meyer, M.T., Thurman, E.M., Zaugg, S.D., Barber, L.B., and Buxton, H.T., 2002, Response to comment on "Pharmaceuticals, hormones, and other organic wastewater contaminants in U.S. streams, 1999-2000--A national reconnaissance: Environmental Science and Technology, v. 36, no. 18, p. 4007-4008. Kolpin, D.W., Furlong, E.T., Meyer, M.T., Thurman, E.M., Zaugg, S.D., Barber, L.B., and Buxton, H.T., 2002, Response to comment on "Pharmaceuticals, hormones, and other organic wastewater contaminants in U.S. streams, 1999-2000--A national reconnaissance: Environmental Science and Technology, v. 36, no. 18, p. 4004. Meyer, M.T., 2004, Use and environmental occurrence of veterinary pharmaceuticals in the United States, in Kummerer, K., ed., Pharmaceuticals in the environment--Sources, fate, effects, and risks, 2 nd Edition, Springer-Verlag, pp. 155-161.